Brian Krumm is in the Department of Pharmacology, School of Medicine, and the Division of Medicinal Chemistry and Chemical Biology, Eshelman School of Pharmacy, and in the NIMH Psychoactive Drug Screening Program, University of North Carolina at Chapel Hill, North Carolina 27705, USA. Bryan L. Roth is in the Department of Pharmacology, School of Medicine, and the Division of Medicinal Chemistry and Chemical Biology, Eshelman School of Pharmacy, and in the NIMH Psychoactive Drug Screening Program, University of North Carolina at Chapel Hill, North Carolina 27705, USA. The largest family of drug targets in humans, and the principal therapeutic targets for at least 30% of approved medications in the United States, are the G-protein-coupled receptors1 (GPCRs). When these transmembrane proteins detect extracellular agonist molecules, they transmit signals to the cell interior through G proteins inside the cells. The receptor is then sequentially phosphorylated to attenuate further signalling. 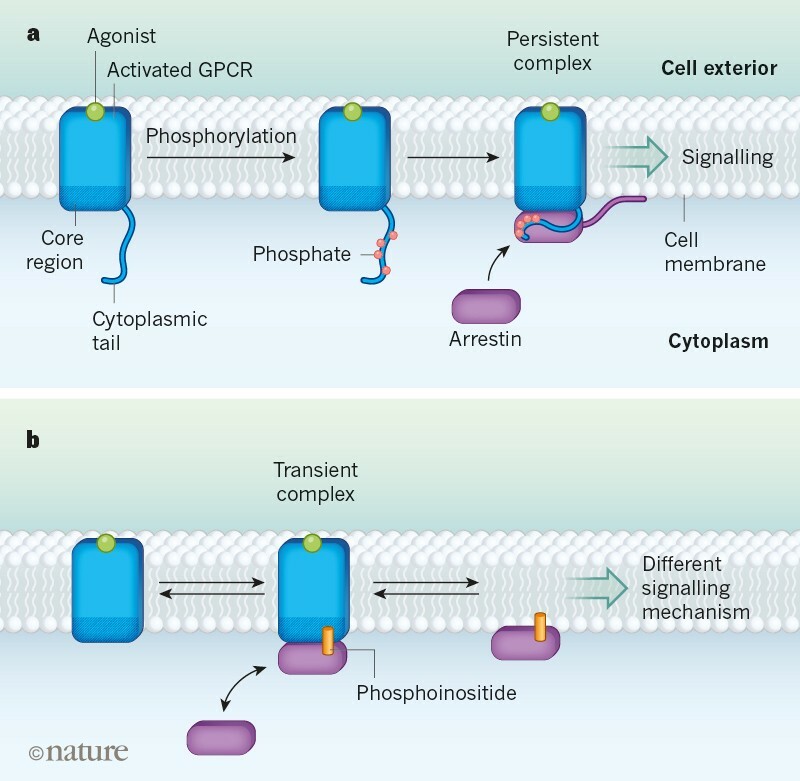 The phosphorylated GPCR binds to an arrestin protein, and both undergo conformational changes that lead to the activation of arrestin-dependent cellular processes. Two papers in Nature, by Eichel et al.2 and Latorraca et al.3, now provide fresh insights into the mechanisms of arrestin activation and its consequences. Given the enormous potential of drugs that selectively target either G-protein or arrestin signalling, these findings might accelerate the development of safer and more-effective medications for a wide range of conditions. Arrestins were first discovered in the visual system, where they bind to and inactivate a light-sensitive GPCR called rhodopsin4. They are now known to be almost universal regulators of GPCR signalling5. The binding of arrestin to GPCRs is enhanced by phosphorylation of the cytoplasmic tail — the carboxy terminus — of the receptors6, and many models for arrestin binding and activation highlight the interaction of the protein with this region of the receptor. It has been known since the 1990s that arrestins also bind at additional intracellular sites of several GPCRs, including the intracellular loops7,8 (GPCRs have three intracellular loops that connect adjacent transmembrane regions of the receptor). In the past few years, structural9 and biophysical studies10 of arrestin bound to rhodopsin have clearly shown that arrestin binds to phosphorylated residues in the C terminus, as well as to a receptor core domain that includes intracellular loops 2 (IL2) and 3 (IL3). How these interactions lead to activation of arrestin and subsequent signalling has been obscure. Latorraca and colleagues now cast light on this issue. The authors began by performing extensive computational simulations of the molecular dynamics of arrestin, both alone and during its interaction with various regions of rhodopsin. Their results indicate that ‘active’ arrestin fluctuates between active and inactive states, and that the receptor core domain and the phosphorylated tail can individually stabilize arrestin’s active state. Moreover, the active arrestin conformation is stabilized to an even greater extent when bound to both the core and the phosphorylated tail. The authors went on to perform further simulations of arrestin’s interactions with the core domain. These suggest that a region of arrestin known as the finger loop stabilizes an interaction with the GPCR core domain, whereas interactions with IL2 and IL3 seem to trigger activation of arrestin. A key insight from the molecular-dynamics simulations is that the two regions of arrestin to which the GPCR binds are allosterically coupled to each other: motions of the regions that bind the C terminus are coupled to motions of the regions that bind to the core, and vice versa. Importantly, the authors confirmed these computational findings directly in biophysical studies, using arrestin mutants tagged with fluorescent labels to monitor conformational changes at the protein surfaces that interact with the receptor’s core and C terminus. Latorraca and co-workers’ simulations also suggest that the activated state of arrestin seems to persist even when the protein is not bound to the receptor. In their companion paper, Eichel et al. expand on and validate this prediction. The authors re-examined a phenomenon they had described previously11, in which a GPCR known as the β1-adrenergic receptor (β1AR) interacts with arrestin only transiently when activated by an agonist. Arrestin then seems to be trafficked, independently of β1AR, to clathrin-coated endocytic structures (CCSs; vesicles that transport molecules into cells), where it can activate signalling proteins. This phenomenon is reminiscent of earlier findings that showed segregation of arrestins and GPCRs under some circumstances12. Such segregation was not anticipated by early models of GPCR–arrestin interactions, which posited that a stable GPCR–arrestin complex is essential for arrestin signalling13. 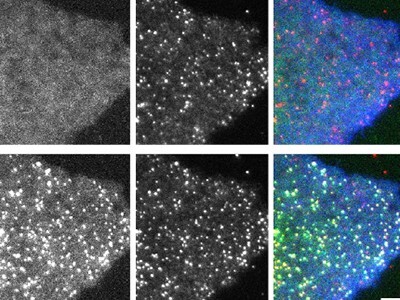 Eichel and colleagues used a combination of microscopy techniques to show that transient engagement of the GPCR core, but not the C terminus, leads to prolonged accumulation of activated arrestin in CCSs. Such activation can be thought of as catalytic, because the GPCR activates arrestin but does not participate in subsequent downstream activation events — analogous to the way in which catalysts speed up reactions without directly taking part in them. The authors also demonstrated that the binding of phosphorylated lipids known as phosphoinositides at the cell membrane is essential for the capture of arrestin in CCSs after transient activation by GPCRs. The activated and GPCR-free arrestin can then activate downstream effectors such as ERKs. Taken together, these two papers open up a stunning new vista of GPCR–arrestin interactions in which an essential, bipartite interaction occurs through the receptor’s core and phosphorylated C terminus (Fig. 1a). This engagement can lead to the formation of the persistent GPCR–arrestin ‘scaffold’ complexes that have frequently been observed and reported. An additional, transient form of this interaction leads to the catalytic activation of arrestin, which then accumulates in CCSs and triggers a specific form of arrestin signalling (Fig. 1b). 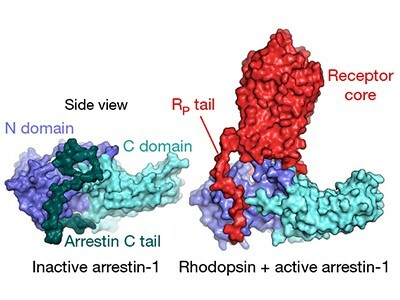 It remains to be seen whether the mechanism of arrestin activation suggested by Latorraca and colleagues’ molecular-dynamics simulations and by the structure of the arrestin–rhodopsin complex9 is widely used by other arrestins and among GPCRs that do not undergo phosphorylation. The idea of developing ‘biased’ GPCR agonists that selectively engage either G-protein or arrestin signalling13 has tremendous potential for drug discovery. Such biased agonists have been proposed as safer and more-effective treatments for many disorders, including schizophrenia, chronic-pain conditions and heart disease14,15. By revealing cellular pathways for scaffold-based and catalytic arrestin activation, the current papers provide fresh insights that might accelerate the discovery and validation of biased GPCR agonists as therapeutic agents. Sriram, K. & Insel, P. A. Mol. Pharmacol. 93, 251–258 (2018). Eichel, K. et al. Nature 557, 381–386 (2018). Latorraca, N. R. et al. Nature 557, 452–456 (2018). Wilden, U., Hall, S. W. & Kühn, H. Proc. Natl Acad. Sci. USA 83, 1174–1178 (1986). Luttrell, L. M. & Lefkowitz, R. J. J. Cell Sci. 115, 455–465 (2002). Palczewski, K., Buczyłko, J., Imami, N. R., McDowell, J. H. & Hargrave, P. A. J. Biol. Chem. 266, 15334–15339 (1991). Wu, G., Krupnick, J. G., Benovic, J. L. & Lanier, S. M. J. Biol. Chem. 272, 17836–17842 (1997). Gelber, E. I. et al. J. Neurochem. 72, 2206–2214 (1999). Kang, Y. et al. Nature 523, 561–567 (2015). Zhou, X. E. et al. Cell 170, 457–469 (2017). Eichel, K., Jullié, D. & von Zastrow, M. Nature Cell Biol. 18, 303–310 (2016). Bhatnagar, A. et al. J. Biol. Chem. 276, 8269–8277 (2001). Luttrell, L. M. et al. Science 283, 655–661 (1999). Wacker, D., Stevens, R. C. & Roth, B. L. Cell 170, 414–427 (2017). Smith, J. S., Lefkowitz, R. J. & Rajagopal, S. Nature Rev. Drug Discov. 17, 243–260 (2018).